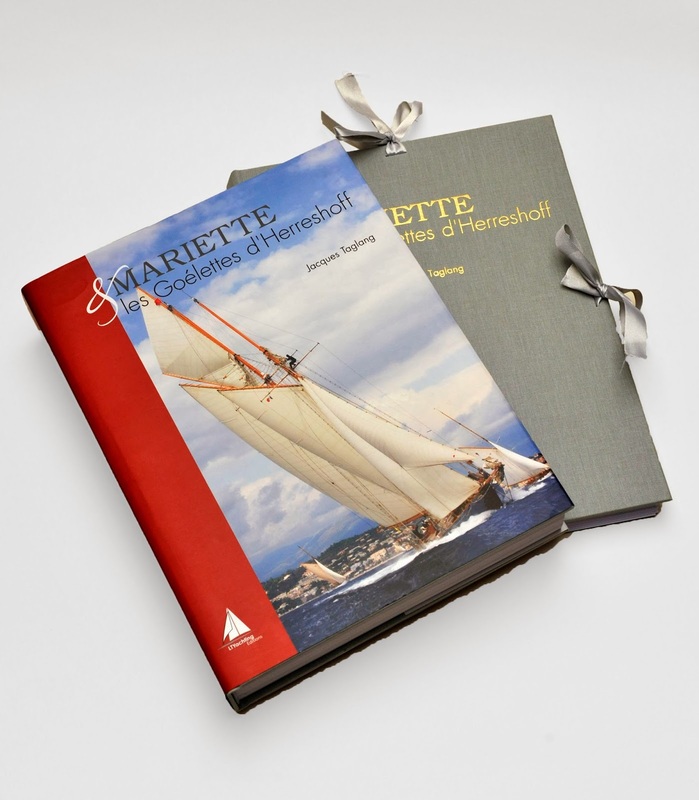 Mariette and the Herreshoff schooners - 536 pages on the history of this famous schooner and the only fifteen other schooners designed by the “Wizard of Bristol”. A surprising discovery! Many passionate writers and personalities have collaborated with Jacques Taglang, the author: Maynard Bray has written the preface; Louis Boudreau, John Lammerts van Bueren, Thomas Eaton, Christopher Gartner, Llewellyn Howland III, Luigi Lang, Claas van der Linde, Erik Pascoli and Charlie Wroe have made important contributions to this book, illustrated with photography by Nigel Pert. The De Luxe edition is sold out. Here is the captivating story of a long, magical cruise through time. It takes the reader on an exciting voyage of discovery aboard a remarkable yacht, the steel schooner Mariette, launched in 1916 and one of the last American yachting "cathedrals". The reader will discover the secrets of this wonderful yacht, a vessel designed by the celebrated "Wizard of Bristol," Nathanael Greene Herreshoff, arguably the most brilliant and inventive naval architect of all time. Six consecutive victories in the America's Cup from 1893 to 1920 underline the outstanding talent of this larger-than-life character. Mariette is a legendary boat and one of less than a handful of surviving major creations built by the Herreshoff Manufacturing Company (HMCo) of Bristol, founded in 1878 by Nathanael Greene and his blind brother John Brown. What is the secret behind the longevity of this yachting masterpiece? Of course, the talent and know-how of the steelworkers and riveters from Bristol played a major part, but there was also the commitment of Mariette's 17 owners and her intrepid captains. The passion of these women and men played a vital role in the yacht's survival - and continues to do so. Included are testimonies from many of personalities who lived the adventure. They relate many until-now unknown and - sometimes chaotic - aspects of Mariette’s various lives. 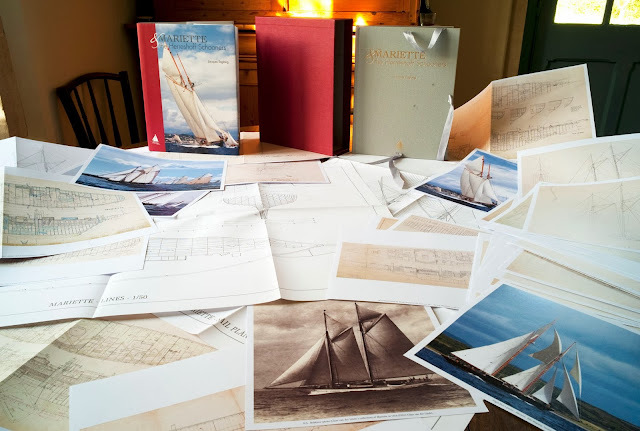 The story reveals why Mariette is still sailing today in a configuration virtually identical to that of 1916 and is accompanied by numerous plans and drawings. Research for the book (and the story told) wasn't limited to Mariette alone. She was one of a small number of schooners designed and built by Herreshoff - and this book, illustrated with beautiful photography, looks at all of the members of this modest fleet. During his long career, Nathanael Greene created a tiny number of schooners in relation to his total output. There were just 15, all but one built between 1903 and 1926. Nine were steel (Mariette is part of that legendary set), three were composite and two were of wood. So why so few schooners and what's the reason for the "Wizard of Bristol" converting less than a dozen of his sloops and cutters to schooners when so many rich yachtsmen wanted to sail under this rig? This tale tries to discover the reason and also offers a complete inventory of these yachts, along with the stories of what happened to them through their lives. The research behind the book makes it possible for the first time for anyone to see the original construction plans and sail plans of these marvelous vessels. On entering the confines of the Wizard’s archives, another surprise awaits the passionate - a collection of unfulfilled schooner projects drawn between 1888 and 1938, the year of Nathanael death. These un-built schooners appear to show a hidden interest by this genius for a type of rig for which most evidence suggests he held no particular affection. Weird! Herreshoff's legacy has fascinated many yachting lovers but none so much as the two enthusiasts who built Eleonora and Elena - full-size (and highly accurate) replicas of Westward. In his preface, the American historian and Herreshoff specialist, Maynard Bray, confirms that this book "is one more important step" in understanding the work and thought processes of Nathanael Greene Herreshoff, "the genius we hold in such high regard." …. is the fruit of a collective effort orchestrated by Jacques Taglang, a lifelong yachting enthusiast. 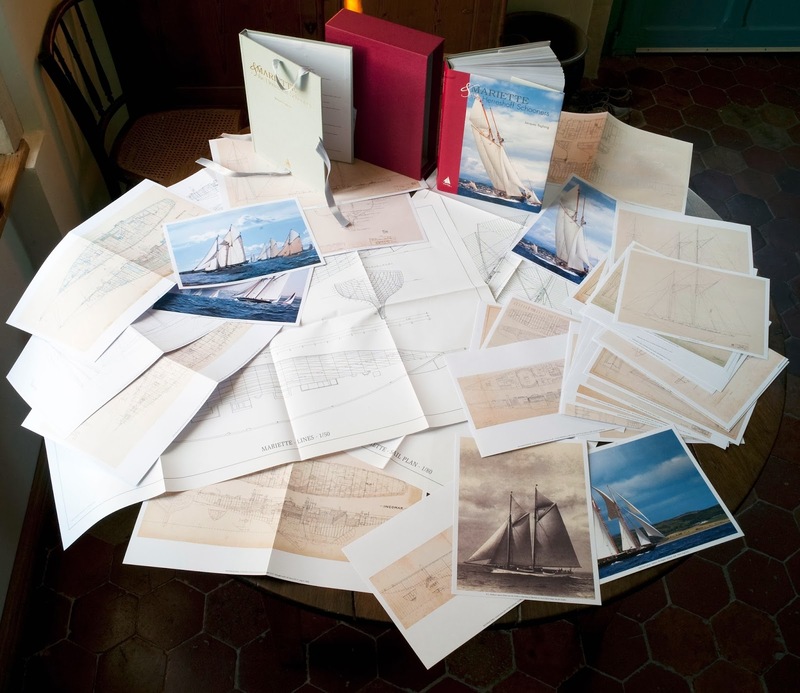 Jacques centered his research on the Herreshoff Catalogue Raisonné - Claas van der Linde's monumental compilation about Nathanael Greene Herreshoff and the work of the Herreshoff Manufacturing Company work. Claas himself has closely followed Jacques’ research, helping him focus some of his development options and also providing additional information and useful corrections. - Luigi Lang. Not only did Luigi help in much of the research but he also prepared the study of the Universal and International rules. Many other testimonies complete this saga, such as those of Tom Perkins, Chris Gartner,Mike Horsley, Jonathan Money, John Clyde-Smith and Luther Dunton. Photos illustrating the book include those by the talented photographer Nigel Pert who has followed Mariette for over 15 years. To these are added many vintage black and white pictures including those of Edwin Lewick; Beken of Cowes; the Peabody Essex Museum; theRochester Museum; and the Herreshoff Marine Museum; plus reproductions of two works by the English artist Jamie Medlin. Kurt Hasselbalch - the curator of the Hart Nautical Collections of the MIT - has authorized the first publication of Herreshoff schooner construction and sail plans - 35 in all. Finally, Maynard Bray, a leading specialist on the Herreshoffs, offers an illuminating text on methods of steel-hull building at the Herreshoff Manufacturing Company, and has also written the preface to this landmark work. Voici le récit d’une longue croisière à travers le temps, magique et envoûtante, l’histoire d’un voyage d’exception à bord d’une merveilleuse goélette en acier, l’une des dernières « cathédrale du yachting américain » : Mariette, mise à l’eau en 1916. Chef d’œuvre de l’éphémère, Mariette a connu 17 armateurs depuis sa mise à l’eau en 1916, animés d’une passion sans égale à l’égard de leur goélette, une passion qui nous permet aujourd’hui d’admirer l’un des rares chefs d’œuvres du Sorcier de Bristol, Nathanael Greene Herreshoff. De nombreux témoignages permettent de comprendre pourquoi Mariette navigue encore aujourd’hui, parmi lesquels il faut citer Lou Boudreau, Erik Pascoli, Tom Perkins, Tom Eaton, Chris Gartner, Charlie Wroe. L’ensemble de l’ouvrage est principalement illustré des photos de Nigel Pert ainsi que de nombreuses illustrations d’époque, des plans de Mariette retracés par François Chevalier, et de plans inédits de Captain Nat en personne !